Crowns are the easiest and most cost-effective way to restore your damaged teeth. Also called “caps,” crowns are used to repair broken, cracked or stained teeth. We offer traditional, as well as porcelain crowns, which mimic the tooth’s appearance in the mouth and have a more natural look. We replace a missing tooth (or several teeth) by joining an artificial tooth permanently to adjacent teeth. A bridge is fabricated upon which the abutment teeth are reduced in size to accommodate the material to be used to restore the size and shape of the original teeth in a correct alignment and contact with the opposing teeth. 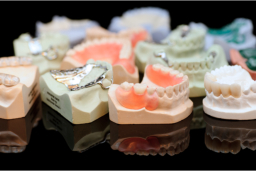 We know that proper denture fitting should focus on both esthetics and functionality. We are committed to customizing your dentures to look and feel like real teeth as well as supporting the lips and facial structure as teeth normally would. For those looking for a cost and time effective teeth restoration, dentures might be for you!